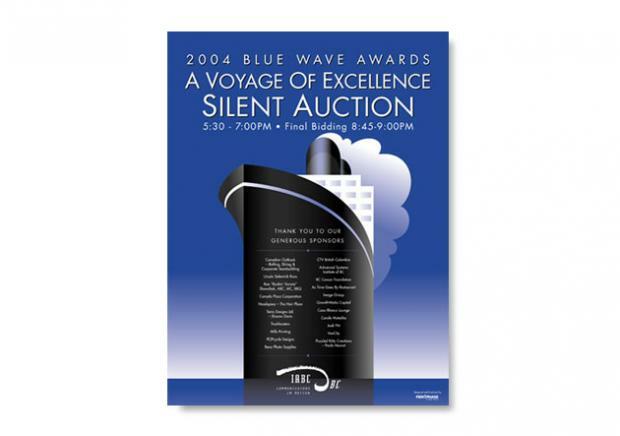 The Blue Wave Awards committee had set a goal of increasing attendance at the event by 5% over the previous year. With the event being held at the same venue and with the same format as the previous year, a professional and captivating invitation was required to capture interest and increase attendance. For consistency, all the items had the same theme and consistent look. 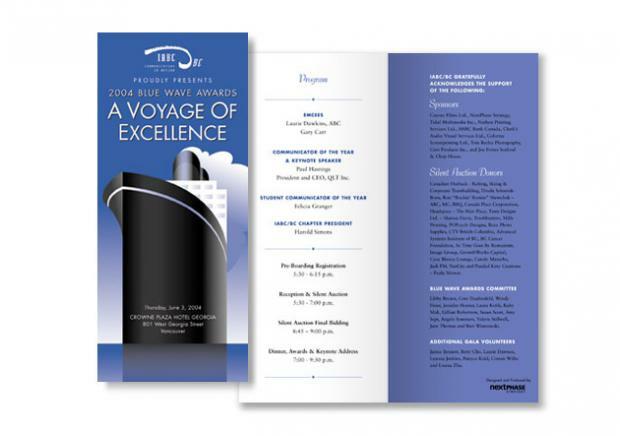 The committee chose a traditional cruise ship theme to portray the elegance of a gala event. The colours of blue and silver were used – blue for the ocean and silver for elegance. NextPhase Strategy created a simple and clean art deco cruise ship illustration that matched the needs of producing an elegant theme. Futura type font was used to provide a bold, easy to read message. NextPhase Strategy worked with the committee to create an email invitation, banner ad for the website, program, PowerPoint template and event poster signs. The results – 20% more people attended the event compared to the previous year, surpassing the goal by 15%. Positive feedback was received on the design work with strong endorsements coming from several senior members. Chapter president, Harold Simons, said, "I just wanted to tell you how great I think the Blue Wave promotion is!!! It brings a smile to my face every time I open the chapter web site and see that big, bright invitation image. It's very professional..."